Disagree - station-keeping propellant for an LLO station would eat your lunch. 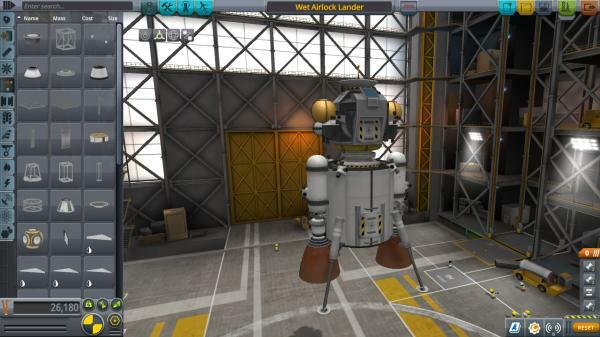 Plus it disallows using the station as a staging point for any other BEO missions. On the first point, not necessarily -- it depends strongly on how low of an LLO we're talking about. Sure down at 50-100km it's an issue, but if you went with say a 500km LLO, it's manageable. 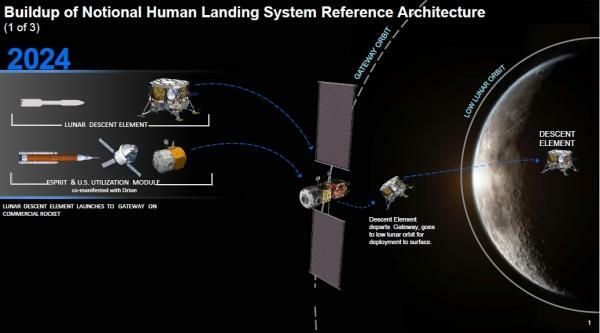 It is true that a LLO gateway is more optimized for lunar surface ops than other BLEO missions, but the Moon is NASA's near- and medium-term focus. I don't think hamstringing their near-term focus for something you could add later makes sense. Why not an 86-degree frozen orbit? It's nearly polar so you have excellent access. Has anyone ever proposed using a wet-workshop airlock? Wet workshops aren't particularly useful for space station applications, but if all you need is a separate room, that's pretty much exactly what you'd need. You'd have your reusable main crew capsule built with the docking port in the floor, rather than the ceiling, and you'd dock feet-first at the gateway. The descent stage would have a docking port welded to the top of a central, cylindrical fuel tank, and that tank would have a hatch cut in one side. After landing, you'd purge the hydrogen tank with nitrogen, vent in residual LOX to bring it up to breathable levels, then open the floor hatch and you've got your airlock. Close the hatch and blast away at the end of the mission. You'd still have to do some level of a plane change to get to a polar site. Frozen orbits are overrated, IMO. At least for this application. It might be simpler and more flexible just to have a reusable inter-orbital tug (maybe just a duplicate of the lander descent stage, sans landing hardware). No. The LOP-G will have a ion thruster so it will need no more than one and a half tonnes of Xenon for station keeping (normally less). The Advanced Electric Propulsion System (AEPS) thrusters have an Isp of 2,600 s.
So the worst case is the LOP-G would require one and a half metric tons of Xenon a year. Anyways, you have to take into account solar array sizing as well. 1500 kg of matter travelling at 26000 m/s is 140 MWh of energy. Assuming thrust efficiency of 50%, you have to harvest 280 MWh per year. In low lunar orbit, you collect energy for 4380 hours per year (12 * 365). You would need 64 KW(280000 / 4380) arrays for just the propulsion portion only. Call it 100 KW as you have a lot of other loads, gradual degradation and you won't be thrusting 100% of the time and you can't store much. The array would have to be 2-2.5x larger than what NASA is currently planning and you need 2+ more engines. Confirm, post corrected. Thank you. The easiest way of doubling the thrust is to fit the LOP-G with two Power and Propulsion Elements. Where the solar panels would go will have to be decided. Based on the NASA media press conference on 2/14 regarding the lunar landing architecture, the Descent Element and Transfer Vehicle Element will be launched on commercial LVs and each will have a wet mass of 15 mT. The Gateway logistic modules have a 7.6 mT (pressurized and/or unpressurized cargo) requirement. LV performance plots, from NASA's website, would indicate that FH expendable is the only vehicle capable of fulfilling both roles. 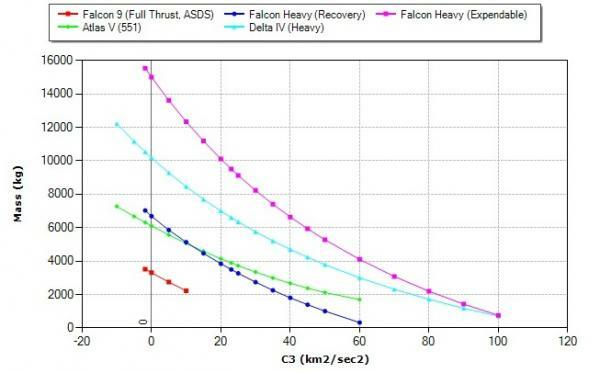 Delta IV Heavy and perhaps the FH recovered could meet the logistic payload requirement. No performance plots were available for NG (2/3 stage) or Vulcan, but informed speculation is welcome. I wonder what does and what does not constitute "credible launch readiness in 202X"? 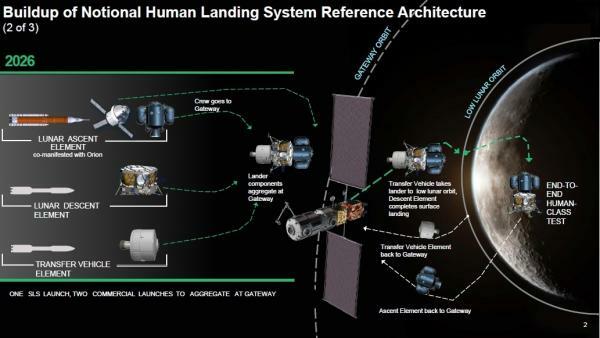 How does Descent stage and Transfer stage get from LEO to Gateway?. At 15mt they can only be delivered to LEO by current commercial LVs. Both are capable of LEO - gateway trip but it'll burn majority of their fuel. Re-usability requires the stages to be refuelled. So a depot or fuelling tanker or both will need developing and sending to the LOP-G.
Do the 3 stages use the same propellant or different propellants? The PPE is thrust limited - its unclear if a 50KW SEP tug can keep up with the intensity and isotropy of the gravity perturbations in LLO. Its more likely that the entire LOP-G complex will move between different DRO and NRHO orbits throughout its life - some of which have a fairly high eccentricity (and low perilune) - capable of supporting surface missions with a far lower dV than a DRO-LLO-surface transfer. The lunar spacestation complex will need thinking through so we can determine its parts and calculate its mass. The sort of thrusting in the DRO-LLO orbits can e determined experimentally by sending a simple nanosat to the orbit and seeing what its ion thruster has to do to maintain orbit. NASA could make and launch this in two years. A modified architecture using existing HW. So many of the contractors would be real happy. FH expendable can send that direct to TLI today. DIVH can send that roughly to GTO today. Single-launch Vulcan can nearly do that to TLI (somewhere between GTO and TLI). New Glenn can send it to somewhere a bit short of GTO. You do realize that the Sky Crane Mars landing system utilizes aero braking and a very large parachute to do most of the deceleration. The brief rocket powered landing phase is for terminal touch down of the rover and the removal of the rover carrier from the landing site. Disposal will likely be lunar impact - like Lunar Orbiter 1, Lunar Orbiter 2, Lunar Orbiter 3, Lunar Orbiter 4, Lunar Orbiter 5, GRAIL A, GRAIL B, LADEE, LCROSS (2 objects), Lunar Prospector, Ranger 4, Ranger 6, Ranger 7, Ranger 8, Ranger 9, Explorer 35, Explorer 49, Surveyor 2, Surveyor 4, the Apollo-10 LM descent stage, Apollo 11 LM ascent stage, Apollo 12 LM ascent stage, Apollo 14 LM ascent stage, Apollo 15 LM ascent stage, Apollo 16 LM ascent stage, Apollo 17 LM ascent stage, a bunch of Saturn V upper stages, Chandrayaan-1 (did this impact yet? ), Chandrayaan-1 Moon Impact Probe, Luna 2, Luna 2 third stage, Luna 5, Luna 7, Luna 8, Luna 10, Luna 11, Luna 12, Luna 14, Luna 15, Luna, 18, Luna 19, Luna 22, Hiten, Hagoromo, SELENE, SMART-1, Chang'e 1.